← Cheap. Timely. Convenient. Pick two. Tired of riding alone, I searched out a local Saturday club ride for this past Saturday. I found the OC Rebel Riders. Not sure what the rebellion is about (American flag on the website?? ), but there were 80 riders in the park (Irvine) when I got there at 8am. I went with the longest ride they had, 57 miles. The route went over to the coast and back, twice, via different routes. About 20 in our group. Most were really friendly. I stuck with the faster guys on the climbs and tried not to annoy anyone too much on the descents. My front shifter broke so I’ve been stuck in my small front ring. Tough on the fast sections on PCH. 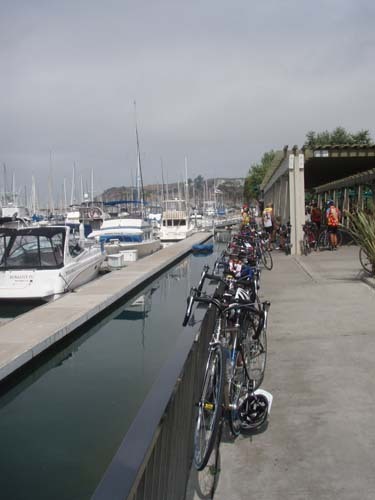 This photo is from Dana Point harbor, the mid-way point. I don’t know if I’ve ever seen so many roadies in one place. My 15-mile ride back from the end was HOT. I think my face was on fire. And that’s what I love about Southern Cali — if you want to ride with people, you can find a group to go with!Wow, Dana Point is far. Good job.